with his quiver and hunting bow. Would you believe me if I told you it was tipping it down less than an hour before we shot these photographs? When I jumped in my car to head to Sparrow's I was begging the sky to keep itself to itself. Loudly. As soon as I got into Oxford, however, the rains started. Noooo. 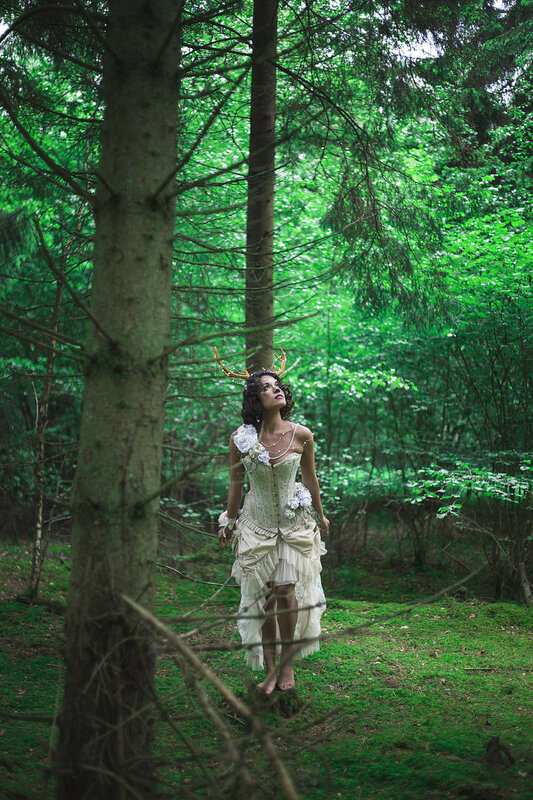 The location I chose was Bernwood Forest, which is fast becoming my favourite location around Oxfordshire, and as soon as the rain started, I imagined that we would be walking into a boggy mess with a cream coloured dress. Uh oh. Somehow, and I am not sure how, Sparrow has some kind of sway over the weather. While we were waiting for the rain to clear, she stomped outside, glared at the sky and gave it a good, old-fashioned talking to. Not half an hour later, the sun started shining. Speaking of magic, we would like to introduce you to Nadine. Nadine has been in front of my camera before, but not for a long, long time and we had been DYING to get her in front of it again. 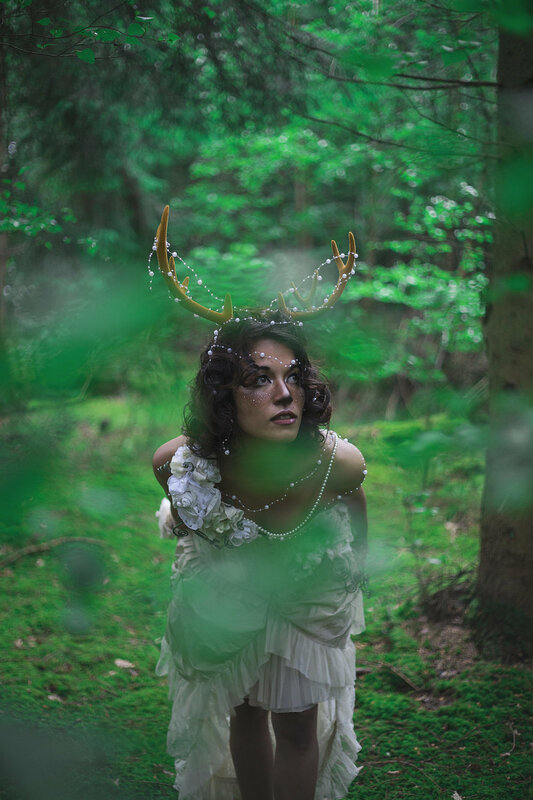 Several months ago, when I bought three sets of antlers, both Sparrow and I without having mentioned it to each other yet knew we needed to get Nadine to model them. 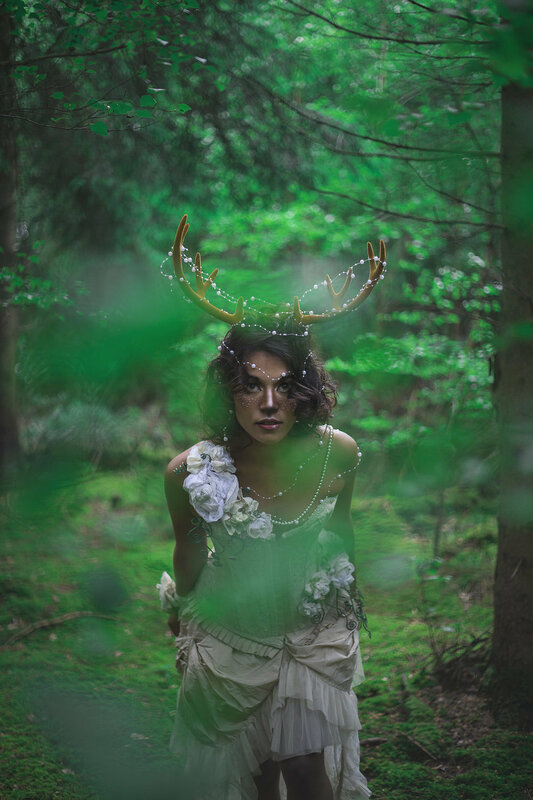 After several weeks of crafting by Sparrow (who I will never be able to thank enough for all of the wonders she creates for us), while we waited for the rain to stop, Nadine became a fawn. I have a whimsical little blue car, which is neither tall nor long and getting Nadine into said tiny little vehicle wearing a corset and rather tall antlers on her head was an experience. One which reminded me how thankful I am to be surrounded by so many mad, brilliant, wonderful and willing people; in this case, people (person) who aren't (isn't) afraid to go through the most uncomfortable (but thankfully short) journey ever all in the name of art. We found the perfect little spot, oddly... and conveniently just by the car park. The floor was covered in moss and everything was that bit otherwordly. There's something incredibly special about seeing a model, completely made-up and styled, on location for the first time and damn, we're good. 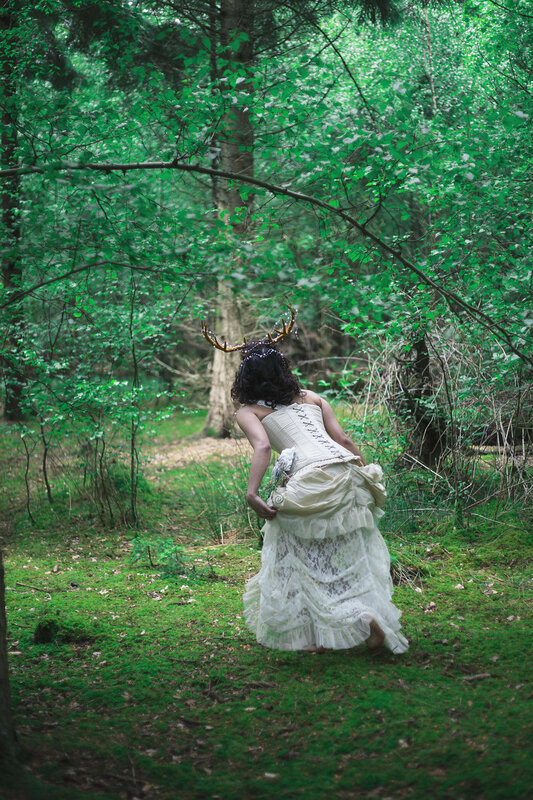 So here we present a little slice of fantasy, with styling, makeup, hair, crafting and general wonderment by Sparrow, whimsical wandering and modelling by Nadine, and shooting and editing (to a soundtrack of Erutan on a loop) by me.